Visit once and remain enchanted forever, the favourite 1960s package tour excursion still has mountains of charm writes Chloe Glover. A SAPPHIRE sea twinkles from far below as lilting Andalucian guitars accompany flamenco dancers in their impassioned bailes in the grand plaza. 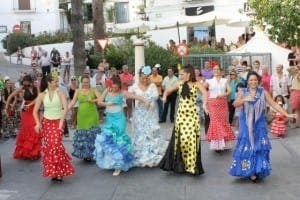 The al fresco fiesta has been a free attraction in Mijas Pueblo every Wednesday at noon since anyone can remember. Everywhere along the flowerpot-adorned streets there are snapshots of typical village life: donkey taxis waiting patiently for their next fare, kids kicking balls, gaggles of elderly gents gently snoozing on shady benches. Only a few kilometres downhill, the village’s sibling coastal resorts of La Cala, Riviera del Sol and Calahonda create a different buzz with their trendy beach bars, fast improving restaurants and vibrant nightlife, adding up to a diverse destination with multiple layers of appeal. 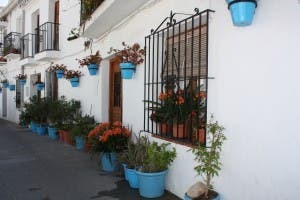 The local population of 87,000 is equally diverse, swelled by a multicultural potaje of expats who have come to enjoy a new life in the year-round microclimate provided by the towering Sierra de Mijas mountains. 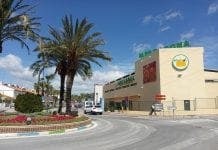 Mijas Costa, a 12-kilometre beach strip stretched between the borders of Fuengirola and Marbella, is a magnet for hotel tourists and holiday home owners. Chris Tarrant and Ryan Giggs are frequent visitors, while Victoria Beckham discovered its spice from spending childhood summer holidays in Riviera. Lorraine Kelly and comedian Stan Boardman also have homes here. 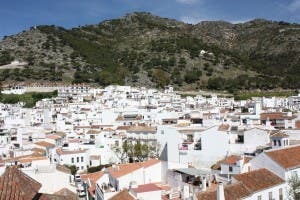 But it is the whitewashed village in the hills where most day trippers begin their discovery of Mijas, a village steeped in heritage and culture. 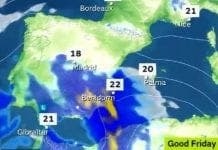 from Malaga and a short drive from the major tourist resorts of Fuengirola, Torremolinos and Marbella. Spending just half an hour in its meandering maze of Moorish streets, where terraced restaurants with tiny darkened doorways lead onto expansive sun-filled patios with mountain views, is enough to understand its allure. 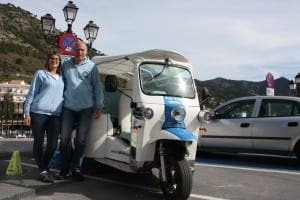 “There are so many reasons to stay longer,” says Rudi Van Der Zalm, owner of Tuk Tuk Spain whose nippy three-wheel transporters now offer an alternative to the famous donkey taxis. Spain’s only rectangular bull ring, original works by Picasso and Gaudi and, something no other resort can surely lay claim to, a miniature of the Last Supper painted onto a single grain of rice. Couple that with the friendly welcome from baristas and shopkeepers and if you’ve never visited Mijas before you’ll wonder why not. A few strides away is the fascinating old village flour mill. 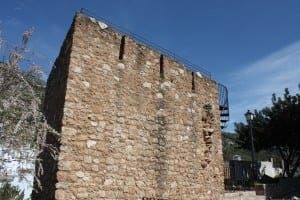 Chiselled into the rock face, a faithfully reconstructed workshop with original machinery sits inside. A few paces down a slope lies the Virgen de la Pena grotto, a rugged little chapel excavated in the rock in 1548. Legend has it that it was here the Virgin Mary appeared to two children, bringing joy to the villagers. And it is impossible to miss the bright yellow building that houses the Carromato de Mijas museum. Once the private collection of hypnotist Juan Elegido Millán, this weird and wonderful treasure trove of miniature items gathered from around the globe makes Ripley’s Believe It or Not seem tame. Take your eye to the magnifying glasses to admire everything from a microscopic version of Leonardo da Vinci’s Last Supper and a painting of Abe Lincoln on a pinhead to a ballerina carved into a wooden toothpick. 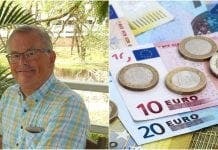 You’ll also feel good to know your €3 entrance fee will go to Afesol, a Costa del Sol charity caring for people with mental health issues. Venture deeper into the village to find the non-conformist bull ring. “There was just no space to give it the traditional circular shape,” explains Rudi who shares the villagers’ pride in the rectangular arena and all the village’s kooky attractions. 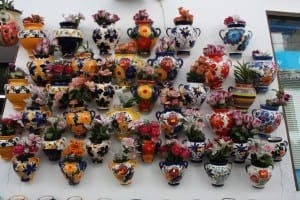 Mijas is also big on fiestas, both new and traditional. The pretty white Immaculate Conception church is the starting point for the popular Semana Santa religious parades while the open air auditorium opposite hosts al fresco concerts throughout the summer. The brief thigh-burning walk up to the Moorish tower vale la pena, as the Spanish say, for 360 degree coast to mountain views although photogenic vistas can be found at every twist and turn of the village streets. The picture postcard calles were inspired by the north African settlers to keep the heat of the Mediterranean sun at bay and it’s all too easy to lose hours discovering their devious charms. But you haven’t ‘done’ Mijas until you’ve visited its ethnographic museum – a lovingly put-together two-floor exhibition that guides visitors through the village’s past – and the Contemporary Art Centre for those Picassos and Gaudis. Those who have the energy should also take advantage of the numerous walking routes from town that zigzag up to the mountains and down to the coast. 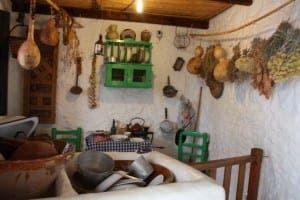 “I feel so much pride for my village,” says a beaming Rosalia Villatoro Alarcon, an ethnographic museum volunteer who has lived her whole life in Mijas. Mijas is mouthwatering too. Multicultural cuisine is served alongside Andalusian specialities in this very international pueblo, where Argentinian and Canadian restaurateurs vie for trade with the local Spanish spots. You can even make your own chocolate at the curiously-named Mayan Monkey Mijas, the only chocolate factory and shop for miles around – and a fantastically ethical one at that. 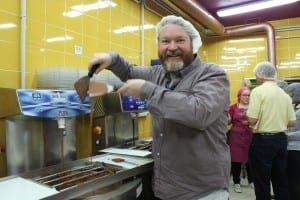 “It’s the most fun job in the world and it’s thanks to Mijas’s continued appeal that I have it”, said co-founder Jason Godwin, originally from Glossop, who shares his passion for chocolate with tours and workshops and claims the Mijas mountain air gives it a distinctive flavour. One of his shop staff, Claudia, regaled us in a brilliant Blackburn accent with the story of how her mum found her forever home in Mijas after meeting her Malagueno husband. “She was a tour guide and met him while he was working on a reception desk of a hotel nearby,” says Claudia. Even if you’re not tempted to put down roots yourself, you can take a piece of the village away with you from the many delis and speciality shops selling everything from exotically-flavoured honeys to pretty porcelain plates. In a more modern and sophisticated way, the scene on the coast is just as eclectic. One of the most profitable destinations on the Costa del Sol, Mijas Costa’s swanky seaside urbanisations and hotels all offer sandy beaches and a great range of restaurants and water sports including jet skis, waterskiing, wakeboarding, windsurfing and parapenting. Las Lagunas on the fringes of Fuengirola offers retail therapy for shopaholics while the small, whitewashed fishing village of La Cala has morphed into a popular resort town with over 20,000 residents, offering a complimentary if strikingly different charm to its antique sister pueblo in the hills. Visit once and remain enchanted forever, Mijas is still one of the brightest stars on the Costa del Sol.